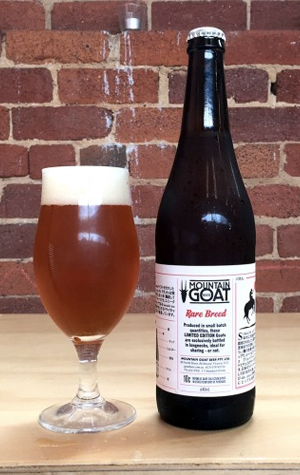 Not long after completing their sale to Asahi, Mountain Goat decided to pay tribute to their new owners in beer form. They created the Japanese Cowboy, the sort of American style IPA they love given a twist in the shape of the use of quirky Japanese hop Sorachi Ace. The draught release was well received so they've brewed more of it, popped it into bottles and are making it their latest Rare Breed release – complete with tasting notes almost entirely presented in Japanese. The Japanese hops are kept company by some big-hitting Americans too and it's these – Chinook, Simcoe and Columbus – that seem most prominent within the subtle, citrusy aroma. It's late on in the flavour of this glowing copper beer that we picked up the Sorachi more, adding a dash of its herbal, lemon curd characteristics to proceedings. The most notable thing about the beer, however, is just how smooth and balanced it is, massaging 7 percent ABV and a reasonably sizeable hopping regime into a dangerously drinkable drop.